I've done 3 oil changes on my truck (2001 Edge model with the 4.0). And each time I have the same problem: the catalogue in Autozone points me to the wrong size filter. Does anyone know why this could be? Even the Motorcraft filters (FL820S) are the wrong size, and every wrong sized filter is the same, they're always too wide. I'm about to do an oil change today and ran into the same problem at the store. I know that the SOHC engine started in '01, but is it possible the catalogue has the OHV filter in it? 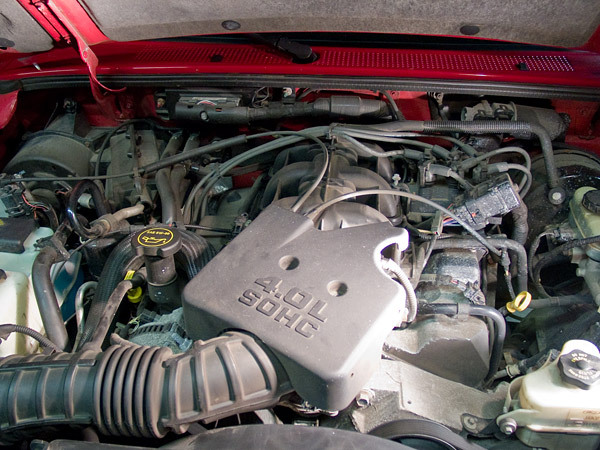 Do you have a 4.0l SOHC engine? Other possibility is that it has the OHV oil filter housing instead of the SOHC housing, not sure if that is even possible??? Last edited by RonD; 05-24-2017 at 10:47 AM. It says SOHC on the little cover over the throttle body. 8th digit on the VIN is E. Everything indicates that it's a SOHC and it's an '01. But I've tried that FL820S filter and it's much wider than the housing. It must have the OHV housing... Is that a thing though? They're entirely different blocks, I would've thought it could only have the SOHCs housing. I'll take a look at an FL1A filter to see if it fits though. Thanks for the reply. Explorer 1997 to 2001 VIN E used these, so maybe not that odd, but still confusing, lol. The FL1A filter is larger than the FL820S. I don't think it is larger in diameter but it is longer. I don't think there is much difference in the base but I don't have the two to compare. When you say it is too wide, what exactly do you mean. There is really no housing for the filter. It just has a base to screw onto. The area that the seal contacts and the threads are the most important parts. If the filter screws on and the seal contacts the flat surface of the mating filter base it should be good. The outside of the actual filter does not mate up to anything. By too wide I mean the seal neither contacts the housing surface, nor is it able to screw on. The filter is a lot larger than it should be. Last edited by RonD; 05-24-2017 at 05:50 PM. Since your description says that it is truly a 2001 Ranger 4.0 SOHC build, then it has probably had the block replaced with one from a 97~01 Explorer w/4.0 SOHC. Ranger 4.0L switched from FL1A to FL820S beginning with 2001MY when the 4.0L engine option changed from OHV to SOHC. 97~01 Explorer 4.0L SOHC used the FL1A and made the switch to the FL820S beginning with the 2002MY. That could be. I know nothing about this trucks past beyond a year ago, so maybe the engine has been swapped. It does sound the most likely. Is it possible the housing itself could've been switched or is it cast into the block? Some(many) of the 1997 to 2004 4.0l SOHC engines did need to have timing chains and tensioners replaced. And that did require the engine to be pulled out to replace the rear chain. Ouch. Well it looks like I'm keeping to FL1A filter housing untill I do a motor swap/rebuild. At least I know what filter I need though. Thanks for the help!